Brive travel to Edgeley Park to face Sale Sharks in a potential Amlin Challenge Cup Pool 2 decider on Sunday afternoon on the back of an 18-9 home win in Round 3 that provided both four points and a badly needed morale booster. And 12-times capped French back Alexis Palisson believes they can now build on that win and take a big step closer to quarter-final qualification as the Pool winners. “The Round 3 victory over Sale was a huge morale boost for our team considering we are going through a tough time in the Top 14 and have not won in our domestic league since September,” said Palisson. “We desperately needed to win a game and regain some confidence so you can imagine our relief at the final whistle. “Now we aim to earn at least one point more than Sale and that means at least a losing or winning bonus point at Edgeley Park next weekend. “Of course it goes without saying that we will need to secure wins as well in our last two group games at Petrarca and El Salvador. “Despite the result and the two tries I scored, the game was really tough and it certainly was not as easy as the scoreline might suggest. We were opportunists in that game and used those opportunities well but they got close to our try line on several occasions and could also have scored. “That emphasises it will most certainly not be a picnic at Sale, far from it. They will fight back and show us what they really are capable of producing. “Because they are solid in the basics, they are strong and have very dynamic three-quarters who know their rugby. 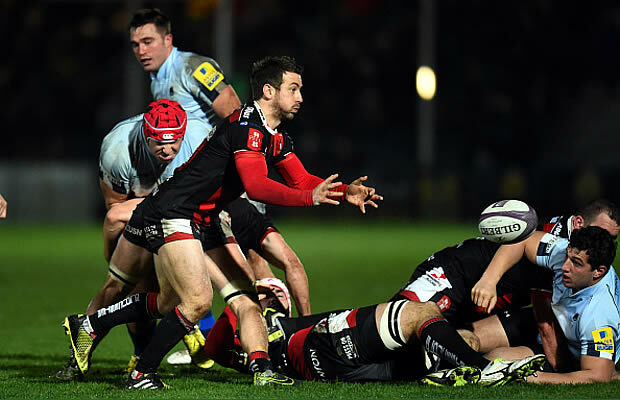 “We have already tasted a heavy defeat on their turf in the Amlin quarter-finals in 2008 so we know what to expect. If we are to defeat them again we must play our best rugby and do even better than last Saturday. “Provided we don’t get upsets in the games against Petrarca and El Salvador, this return fixture against Sale Sharks will be crucial – if not decisive – in determining whether we are first or second in the pool. “But you never know what can happen on Italian soil. Many other clubs have now been stunned by unexpected defeats against Italian clubs. In front of their own crowd they are full of fight and Latin spirit. “It’s always tough against them because they are passionate yet borderline when they play, they manage to remain just within the disciplinary boundaries, so they prove to be trying opponents. 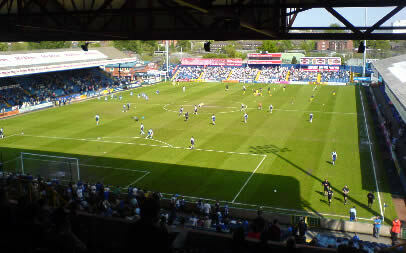 The Edgeley Park pitch has been marked in readiness for Sunday’s Amlin Challenge Cup game against Brive. With frost expected tonight the new covers have been rolled out and the secondary covers will double up the protection in front of the Shoretel Stand which never catches the sun during the winter months.